How often have you walked into a company’s reception area and felt rather under-whelmed? Nothing says more about a business than that first instance when you walk through the door and get a glimpse of their corporate DNA, or sadly in some cases, the lack of it. It never ceases to amaze me how companies seem to forget that their business environment should reflect their corporate brand values and create a powerful first impression. If a visitor is met with peeling paint, faded furniture and dismal decor, it can actually serve as a signal that you don’t care about your brand, business or people. We’ve all heard the old saying “first impressions mean everything “, the same can be applied to your own business environment. In order to put your guests at ease, you need to create a space that is both inviting and professional. 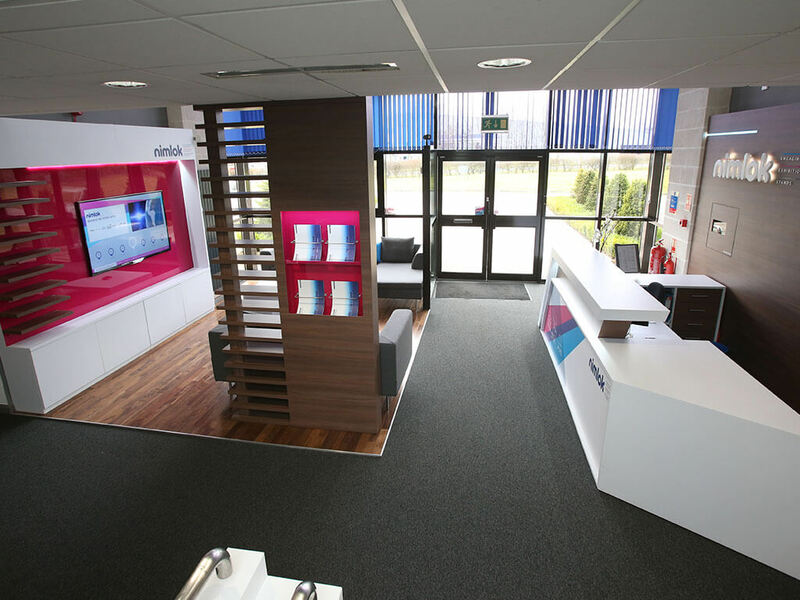 The design and layout of your reception area will speak volumes to your visitors, especially if they are prospects or prospective employees. Create unique memorable experiences through functional, inviting and aesthetically pleasing design and layout by using a creative mix of architecture, lighting, interesting materials and finishes which should leave a lasting impression. One they may even want to share! Your reception area should immediately make a statement about your company’s vision and values. This can be easily communicated through the use of corporate logos and colours. 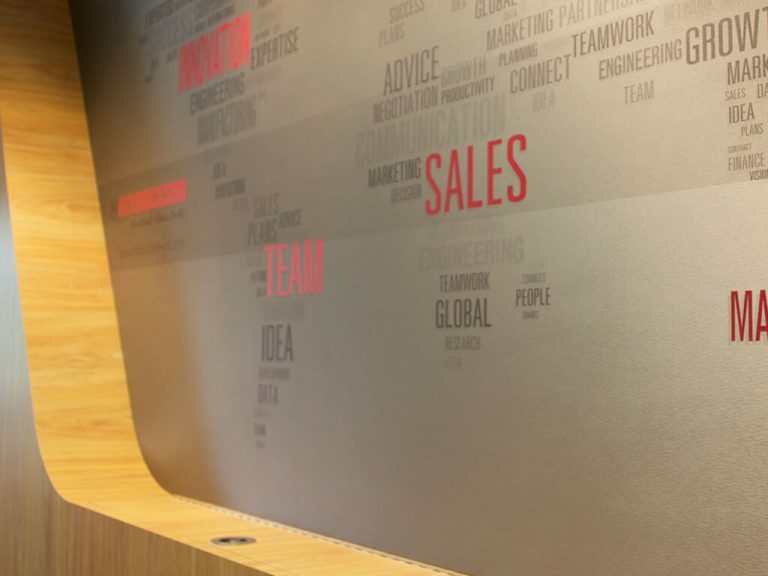 Plain walls, for instance, say very little about who you are or what you do…use the brand-wall behind a reception desk to show-case your corporate timeline or product imagery. If your company manufactures products, why not show them off in display units set out around the area? Also make sure you have enough company literature available for people to flick through whilst waiting. If your company generates a lot of press, it’s always a good idea to have a smart press book available on a coffee table packed full of recent news. Never under-estimate the use of lighting, for instance, halo lighting around your company logo can create quite an impact. 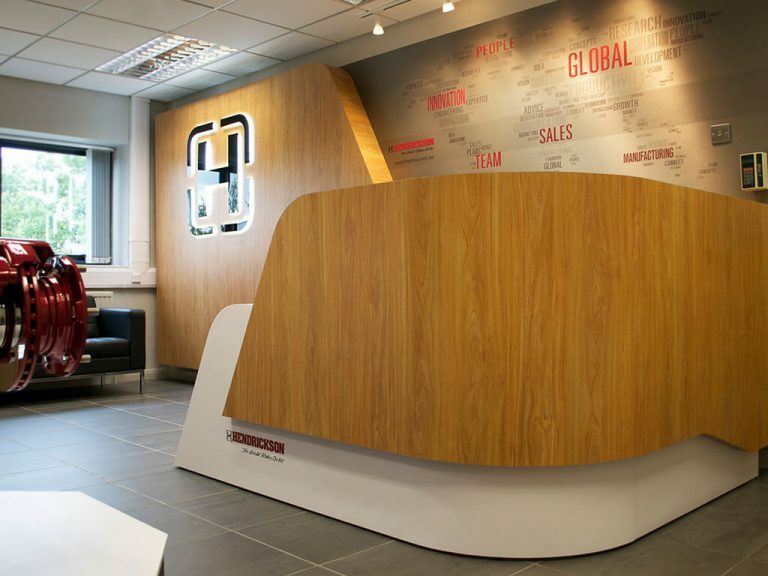 Lighting also around the reception desk can help draw visitors where they need to go. Energy efficient lighting can send a message to your guests that you care about the environment, there are also cost savings to be made. As there is little time to create that all important lasting impression make sure your visitor is given clear signage and cues for where to go. The reception desk should be easy to find and the signing-in process as slick as possible. The receptionist should have everything they need available to help serve visitors. Clever storage tucked away behind the desk incorporated into the design of the reception desk, will aid functionality. Furnish your reception with comfortable and stylish furniture and create a great ambience by infusing the air with the aroma of freshly brewed coffee, or other delicious scents. If there is a long waiting period, then it may be beneficial to provide refreshment facilities, you could incorporate a small coffee/tea point in one area of the room but make sure it is always meticulously maintained. Make WiFi access free and easy to use for your guests and provide an appropriate seating area for them to work if possible. When a visitor walks through your company door you have a captive audience for a limited amount of time, so you need to make sure you inform and educate as clearly and as quickly as possible. Use a mix of digital and physical content to engage your audience. A friendly welcome message displayed across a media screen creates a reassuring impression to a visitor. Loading up corporate/product information (game, survey, quiz or animation) on an interactive pod or display screen will help educate your visitor about your company’s products and services and creates a talking point as well as a positive experience. 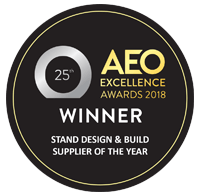 At Nimlok, when it comes to exhibition stands, we’re already experts in conveying a brand through engaging design, architecture, ergonomics and content. 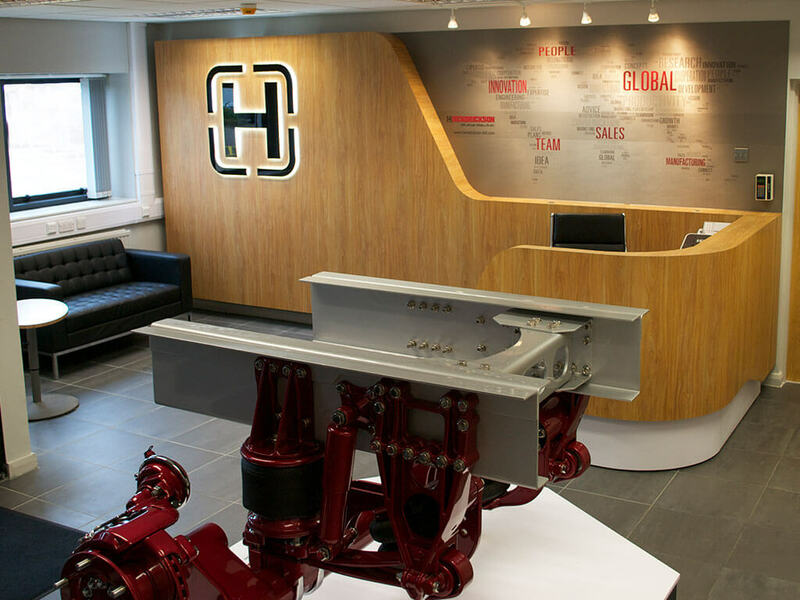 We’re now offering you the opportunity to bring your brand to life in the business environment too, via bespoke reception and showroom features. To discover more please view our reception and showroom video. “Having worked with Nimlok on our exhibition stands for many years and having seen how they’d transformed their reception space, we asked them to come and look at our reception area. 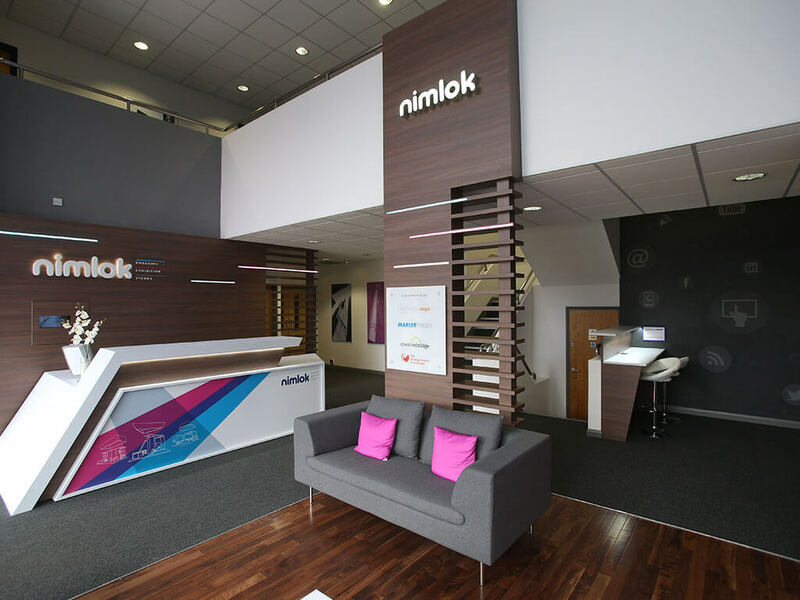 Nimlok’s designer balanced the practical considerations with our aspirations to make a statement in a design incorporating a bespoke reception counter and brand wall, signage, graphics and a product model display plinth. 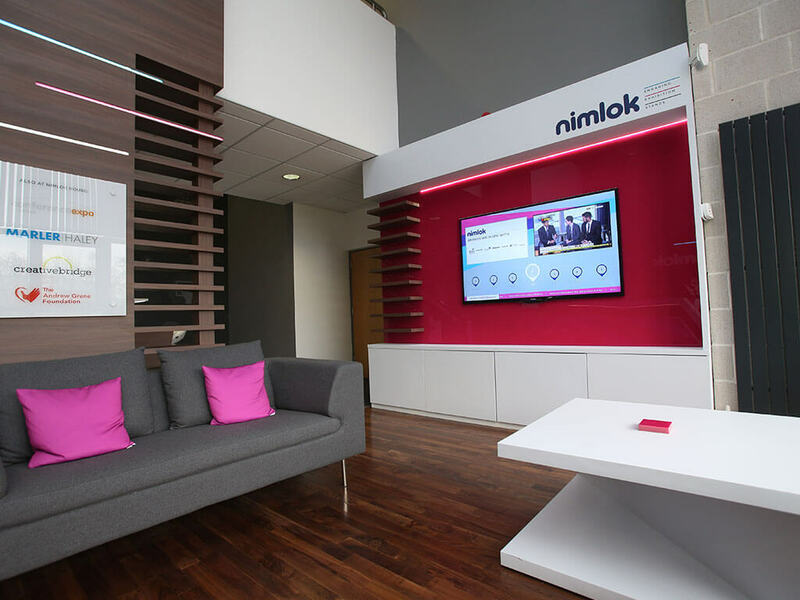 When we progressed, Nimlok’s attentive project manager and installation team worked considerately and swiftly to deliver and end result that our team and our visitors have been wowed by.